Yesterday, Gillian & I went to the beach for a little while, with a couple of her aunties & a cousin & some friends. It was a lovely day. I little on the hot side. That made it the perfect day for going IN the ocean water. I didn't even think it was too cold. It was fine. 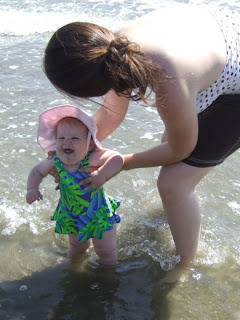 This was Gillian's first time in the ocean. She loved it! My Dad eats oatmeal a lot. He really loves it. I think sometimes, he eats it for breakfast, lunch, dinner & dessert. There is so much you can do with the dish. You can add raisins, for example. And/or milk. He has been encouraging me to make it for my poor little girl, who hadn't experienced the joy of eating oatmeal - until yesterday. I made oatmeal for breakfast yesterday, & this morning. Thanks Dad! We all are healthier for it! Yesterday was my parents' - Mike & Mary Anne Lutz - 35th wedding anniversary. Congratulations to them! Scott & I made this family tree for them, inspired by this one at Red Envelope. Tonight we used our yesterday's leftover grilled sirloin steak in this great dish - Penne with Beef & Arugula. We thought it was TASTY. They also have a link on there to their blog. There I found a delightful post. I was really excited to learn a little bit about Charles Spurgeon's life, from reading this on George Grant's blog. George Grant knows just about everything about everything. One can learn a lot from reading his posts! These little tips are from a book we have that is a collection of all things pertaining to the garden. In this little book, In & Out of the Garden, there are these precious recipes, which I only just now discovered. I thought some people might care to try them out. The ashes of Southernwood, mixed with old salad oil will cause a beard to grow or hair on a bald head. The sappe that issueth out of a birch tree in great abundance, being opened in March or April, with a receiver of glasse set under the boring thereof to receive the same, doth performe the same most excellently and maketh the skin very cleare. This sap will dissolve pearle, a secret not known unto many. Take a quart of honey, as much vinegar, & half so much of white wine, boil them together, and wash your teeth therwith no & then. Who knew honey & wine could keep your teeth clean & white?!! And, I guess using this method, you only have to clean those things every once in a while. See tonight's dinner here, on my epicurious profile. These little suckers are so tasty. I recently saw this quote on another blog, Modestly Yours. It made me chuckle. But, Mark makes a good point. Well, the box arrived today. "What box? ", you ask? The "prepaid-thanks for using cheap CD carriages from Korea-send us your broken XBOX" box! The down side is that the XBOX has become our music machine, movie player, hard-core game machine...basically the heartbeat of our house...um...not really, but it was pretty important. So, no more of that for a while...the upside is that Mr. Gates is sending me 4 months of prepaid XBOX Live...just in time for Halo 3. Gillian and I worked on the idea of "nested objects" today. I was hiding objects inside a metal travel mug and letting her discover where they went. No matter how many times we did it, she was surprised/delighted when I would up-end the mug and her treasures would pour out. Fun stuff. By the way, my wife says her favorite pick-up line is: "Imagine!? You and me walking down the same street on the very same day." 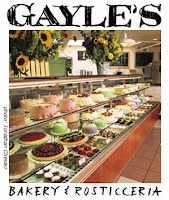 Our local Gayle's bakery will be participating in the bake sale. Hooray! I knitted this little bear while I was pregnant with Gillian. It took a while... Then shortly after Gillian had arrived, & was still too young to notice toys, our terrier dog, Murphy, broke into our room while we were gone. He went from various toys & things, chewing holes. He chewed a whole in the teddy bear!!!!!! I was SO mad. Now, 6+ months later, I have finally got around to repairing it. So, now Gillian can play with it. It feels good to have that behind me. I can put away some of the irritation I feel for the dog, & find pleasure in seeing Gillian play with her bear. Anyone care for some dirty socks dipping sauce with that? Last night we had Grilled Chicken Satays with Peanut Sauce. They were pretty good. I think I would try another recipe the next time we had the desire to enjoy a satay. Or, at least cut down on the fish sauce in the dipping sauce, and increase the peanut butter. Scott liked it. But, for me, I don't want to have that distinctive, pungent flavor, coming out above all the others. I have made many dishes with this southeast Asian favorite. It is scary initially, when you are mixing everything up & you open the bottle & the aroma reaches your nostrils. What was that?! Dirty socks?! Wet dog? Horse blanket? Maybe it was just rotting fish guts... And, even with the terrifying smell, all the dishes I have tried in the past with fish sauce have a lovely flavor. This one... way too strong. No thank you. Sorry Emeril. This one had a little too much "Bam" for me. Anyway. Maybe you want to try it for yourself & see what you think. I am working on putting on a Great American Bake Sale in downtown Santa Cruz. Who wants to help out? It will be the afternoon of Saturday, July 7th, 2007. We got to have Grandpa Bill in town all weekend. He left to return to San Diego early this morning. We had some good times. He took some video of Gillian getting around. That will be special to have. On Saturday, we had Grilled Chicken with Tomato & Bread Salad. We all liked it. But, I think it could have been better. Leah, what recipe did you use when you made it last summer? Can you please post it? Last night we had a picnic at the beach. As you can see, Gillian's main course was sand. The rest of us had Calzones. I re-arranged my kitchen, moving my Italian pottery out of this open hutch, into high cabinets. Now the hutch is full of kitchen items that can double as toys. Gillian loves it! It is so fun for us to watch her pull things out. This morning she had her head all the way back in there, pulling everything out. Juicers, tart pans, muddlers... They are all great for banging & making lots of noise. Scott's sister Kim is moving back north! She just graduated from University of San Diego & got a job near San Francisco. Kim came over for dinner last night, with a friend of hers. We had a good time talking, playing with baby Gillian & eating. We had an old favorite of ours - Pasta with Spicy Sun-Dried Tomato Cream Sauce. Gillian started learning how to crawl last weekend! Her daddy taught her while they were home together & I was at a baby shower... Yesterday she started getting into things, with impressive speed. So, I need to do some rearranging of a few things in order to make the house a bit safer for her (& for our stuff...). We had to start feeding the dogs outside, as the dog bowls are a favorite destination.